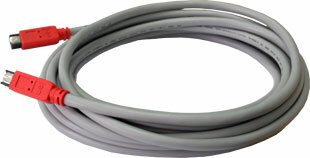 The 10m (33 ft) 1394b cable is available with 9 to 6 pin bilingual connectors (this product) or 9 to 9 pin beta connectors (order part #1636). This long, 25 ft (7.7m ) 1394b cable, offers the most reliable combination of performance and legth, for the most demanding IEEE-1394.b industrial applications. The 0.4m cable is available with 9 pin to 9 pin connectors.